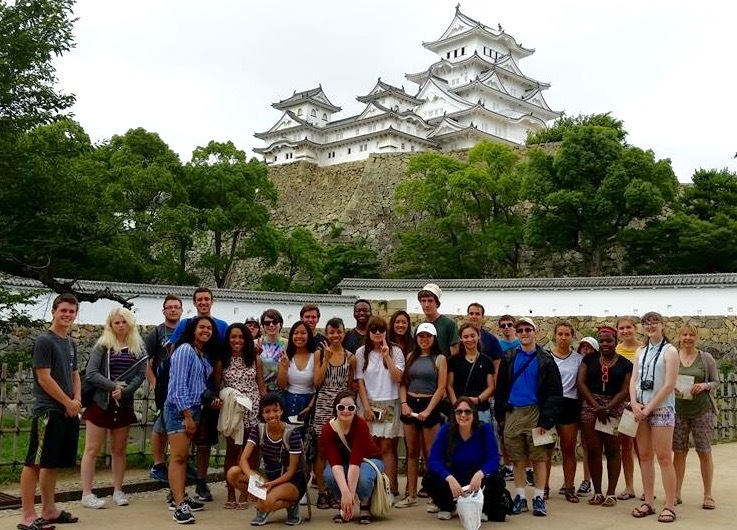 On July 21, twenty-eight American students including one Livingston High School Interact member along with two adult leaders returned safely from Japan after a fantastic experience with their host families on the island of Shikoku in southern Japan. They discovered new foods, learned about the Japanese language and culture and developed friendships that will last a lifetime. They traveled from the Golden Pavilion in Kyoto to the whirlpools of Naruto and from the great Buddha of Nara to the Awa dances of Tokushima. They learned about making paper and indigo dying, learned to defend themselves at the Dojo, and at the many temples and shrines they visited, they learned to be thankful for what they have in life, and how believers find enlightenment. The students visited high schools, beaches and the National TV Station in Kochi. Many of the students spoke at Rotary Club meetings all across District 2670. The team also visited Hiroshima and Peace Memorial Park, where they saw pictures and remnants of the atrocities of war, and learned about efforts to ban nuclear weapons. They were greeted by Mayors and treated like royalty during the entire trip. But with all of these great experiences, the most important thing they learned was about the people of Japan. Their generosity, their humility, their deep concern for others, and their incredible hospitality were the highlights of the trip. They will always remember them and their friendship. Now we await the arrival of 27 students and 3 leaders from District 2670, Shikoku, Japan. On July 28, we will greet their team at JFK Airport and hold a welcoming party at Horseshoe Lake in Succasunna.